Seek Optics Replacement Lenses are specifically and precisely cut to fit perfectly into your Oakley frames. All Seek lenses offer full protection from the sun and block 100% of UVA, UVB and UVC rays. Each lens is finished with several specialty coatings exclusive to Seek Optics. No other manufacturer provides a stronger Anti-Scratch Hard Coating, an advanced Nano-DSX technology developed in Japan, to meet the needs of the most demanding athletes. Our signature Element Repellent oleophobic nano-coating protects your lenses from water, oil & dust, providing the clearest, unobstructed vision during water or land sports while at the same time providing added protection against micro-scratches and wear and tear. Seek Optics lenses are the safest choice to protect your vision. Seek Optics offer a full line of polarized and non-polarized lenses is a rainbow of color options such as red, blue, green, gold, purple, titanium, silver, iridium, brown, black, yellow, clear and amber. Seek REVO Mirror coating differs from other type of mirror coatings because the color is much more vibrant and strong. Our REVO mirror coating, besides giving your sunglass lenses color, brilliance, and style, also protect your eyes from harmful sun rays. The REVO reflective mirror changes color dramatically depending on light and angle. REVO mirrored lenses provide an sharp look that will make any frame stand out! Seek REVO Mirror is a color mirror layer made of insulated materials, which was initially invented to reflect the sun's rays off satellites. A layer of approx 4 nanometers is applied in an even layer on the surface of the lens. The result is a one-way mirror that completely shields your eyes from excessive direct heat and from harmful UV rays. Mirror coating optimizes the available light in your environment to enhance the clarity of your vision and in the meantime conceal the wearer's eye for maximum privacy. 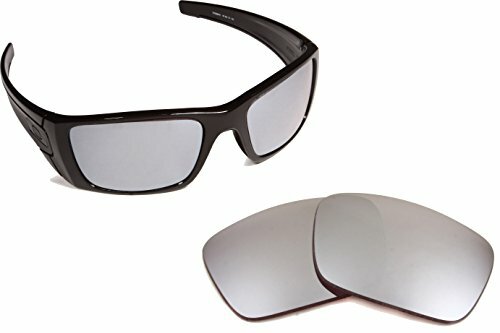 REVO Metallic Silver Mirror Polarized, Versatile lens tint with great color perception and anti-fatigue qualities perfect for sunny environments. Best for medium to bright light conditions. Perfect for driving, baseball, tennis, football, soccer, water sports, and all other outdoor activities. Features a REVO Mirror coating to reduce glare, especially useful for conditions of sand, water, snow, and higher altitudes. SUPERIOR LENS TECHNOLOGY: The entire line of Seek Optics lenses use an advanced Nano-DSX technology developed in Japan. Using a special hard coating, and a double-sided dip-coating method, we achieved an excellent anti-oil prevention (oleophobic) which makes our lenses extremely easy to clean. IMPACT RESISTANT - Exceeds FDA Safety Standards, ANSI Z80.3 and EN 1836:2005 Standards. Seek Optics hard-coating uses Wrap-Coating Technology. The surface of our lenses has a super-hard wearing protection layer and enhanced lens surface hardness which extends the service life of the lenses. Seek Optics hard-coated lenses with our wear and tear resistant surface do not easily scratch or crack. DISCLAIMER: Seek Optics is a manufacturer and distributor of replacement sunglasses lens only and does not offer, market, or sell replica or counterfeit products. Seek Optics is not affiliated with Oakley®, Ray Ban®, Costa Del Mar®, Ray Ban®, Rudy Project®, Spy Optics®, Von Zipper®, or any other manufacturers mentioned on this site. All references to the aforementioned trademarks or brands on this website or elsewhere belong solely to said respective trademark owners. If you have any questions about this product by Seek Optics, contact us by completing and submitting the form below. If you are looking for a specif part number, please include it with your message.